With the excitement of two stories I have before me I’ve decided to put them together starting off with “A Giant Appears” followed by “Don’t Lose Focus“. I have no doubts both will peak your interest. “A Giant Appears” In confinement there are certain creatures whose growth are determined by the space allowed in its habitat. 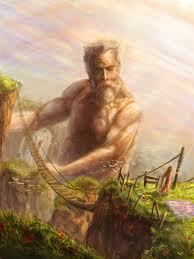 Giants will reach a certain size and for survival purposes the growth of the beast will cease or it finds a way out. Fortunately for those that know and have grown to love this giant I write about, it is refusing to be contained and has found an escape. For all of us that seek out and gleam the prepper/survival information that seems to be flooding the internet it is important that you know one if its biggest players is making a huge announcement. “The beast has escaped” A favorite among many, American Preppers Radio/Prepper Broadcasting will be moving to a 24/7 format. In just a week or two this popular live primetime broadcaster of such notable shows as The Homestead Honey Hour, The Doom and Bloom Hour, I Am Liberty, The Human Path and several others will be expanding to a new 24/7 format. Beside the 12 popular shows already broadcasting, this new format will include more than 30 other great names with the information you want to hear. Great names like Jack Spirko, Lisa Bedford the Survival Mom, Mike the Gardener, Prepper Recon, Amy Alton, and The Survival Podcast. The list is big and it keeps growing. There will also be music, prepper related news clips and much more broadcasting intermittently between shows, 24 hours a day 7 days a week. This new format is a big change for the producer who has been advising his hosts to make the change known through their respective nightly shows. The change and the build up to it are very important as their will now only be one place to catch all the live shows listeners have come to love “Prepperbroadcasting.com”. You can see the list growing by going to the show schedule at prepper broadcasting or take a peek at our new schedule still in bete testing HERE. When the flip happens PrepperBroadcasting will be severing ties with its former host Blogtalk Radio. This means it is imperative that those listeners who target the shows through blog talk have to be informed that those voices will only be available at PrepperBroadcasting.com after the switchover. With all of this change you can still expect the same great hosts you have come love and discover many more. The producer and his Web Master of WolfeBlog.net are also boasting, better sound quality and performance, limited ads with music and highlight Prepper news of the day between shows and soon to come “Short Wave Transmission”. Don’t forget the popular live chat that will be open all day where those of like minds can visit, and share ideas while listening to their favorite broadcasts. You can also hear more details in a short interview about the rising giant included in the player below. “Don’t Lose Focus” Join Katzcradul as she discusses the news and currents events as they relate to our efforts to be informed but not overwhelmed, aware but not distracted. Do you ever feel like your being bombarded with information? Are you ever annoyed when the mainstream news sources run a story into the ground, covering the same drama ad nauseam, when it’s no longer qualifies as news at all? Do you ever get the sense that there are real efforts being made to distract you from your goals of self reliance and self sufficiency? To make you feel unstable and not o.k., although you really are? Don’t lose heart! Katzcradul will be discussing was to maintain your focus and your sanity in these uncertain times. Plan to call in and tell her how you keep yourself grounded in the whirlwind. Katz will discuss techniques she uses to filter the news, stay focused amid the onslaught of information, and to move forward in spite of the never-ending headwind. You can also listen or download this show HERE! The Herbal Prepper on A Preppers Path!